« THE COLUMBIA New Westminster Brewery District Condo Launch! Starling at Lumina Brentwood Condo High-Rise Coming this Fall 2017! Find Life in Balance. Designed for modern living with refined interiors, Starling at Lumina Brentwood Burnaby condos consists of spacious one, two and three bedroom high-rise condominium homes with a collection of 3 bedroom townhomes and cityhomes. Located in the heart of Brentwood, residents at the Lumina Starling condos will enjoy unparalleled access to all areas in the Lower Mainland, with quick access to the Brentwood Town Centre SkyTrain Station and both Lougheed and Trans-Canada Highway. The new Burnaby Starling Condos is the 2nd phase of this Lumina master planned community and presales are expected to start this Fall. Perfectly balanced urban living has a lot to do with where you call home. Welcome to Lumina’s Starling condos, the second of four phases at Lumina, located in Burnaby’s flourishing Brentwood real estate district. Starling at Lumina condos is brought to the marketplace by THIND Properties, a trusted and well established developer. A place designed with one thing in mind – to truly inspire every new day in your life. The presale Burnaby Starling Condos at Lumina are coming this Fall 2017. Brentwood real estate’s best value is now here! Find life in balance at Lumina Burnaby, just steps from a new 13 acre park, Brentwood SkyTrain Station, Whole Foods Market and unbelievable shopping and more. This unique and master planned residential community is designed for ultimate privacy. The interiors at the Lumina Burnaby Brentwood condos are designed by BYU Design with efficient floorplans, integrated Bosch appliances and even air conditioning! The full amenities package at the pre-construction Burnaby Lumina Brentwood condos includes concierge service, an outdoor cinema, guest suites and so much more. One, two and three bedroom Brentwood condos at Lumina are available in early 2017 and start from approximately the $380’s. Please visit www.luminabrentwood.com for more details or you can fill out the simply online form above for the latest information about presales pricing, floorplans and availability. The initial features list is very impressive! The Burnaby Lumina condos will present 2 interior colour scheme options for pre-sale homebuyers to choose from that includes Highstreet and Parkside. They are carefully selected by BYU Design Group. The living areas will have expansive windows that will showcase impeccable views and allow lots of natural light into your home. There are also stylish laminate wood floors in the entry hallway, bedrooms, kitchen, living areas and dining rooms. All homes come with custom milled oversized baseboards in addition to nine foot ceilings. Other standard features at the Lumina Brentwood condos includes climate control with built in air conditioning as well as front loading LG washer and dryer (energy and water efficient). The kitchens at the presale Burnaby Lumina condos in Brentwood will feature a modern full size stainless steel Bosch appliance set that includes a 4-burner gas range, integrated fridge with pull out freezer and integrated energy efficient dishwasher. The kitchen also has a powerful Venmar hood fan, integrated Panasonic microwave oven and elegant quartz stone counters with matching backsplashes. The kitchen also features premium wood grain cabinets with soft close doors, Intivo internal drawer system and single bowl stainless steel undermount sink. The bathrooms at the presale Burnaby condos at Lumina Brentwood features sleep and sophisticated frameless mirrors, recessed LED lighting, oversized, luxurious porcelain tile floors and high quality quartz stone counters. Other bathroom features include wood grain sink cabinetry with under mount LED lights and expansive, frameless glass shower enclosure. A purposefully built neighbourhood at Lumina Towers in Brentwood Burnaby is designed by award winning firm Chris Dikeakos Architects Inc. The master planned community will feature 4 uniquely designed condominium towers, each of which is inspired by the spirit of our coast wilderness. 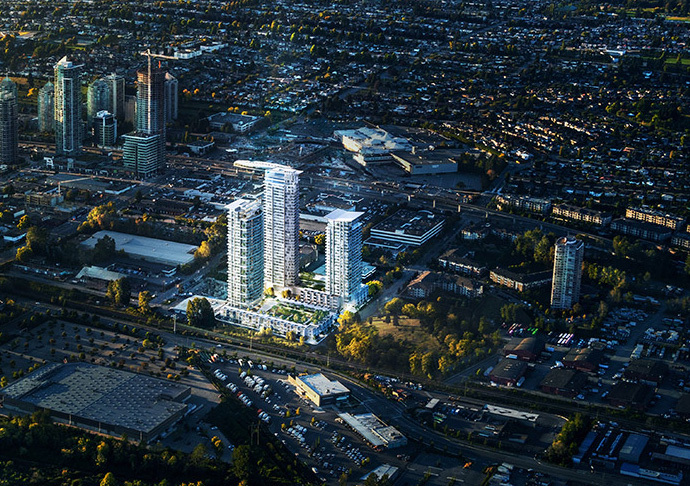 Lumina Condos are located in North Burnaby’s Brentwood neighbourhood, the fastest growing community in the city. Just steps from your new home is an endless variety of restaurants and cafes, boutiques and malls, grocery stores, services, parks, transit and much more. Residents at the new Burnaby Lumina condo towers will have easy access to Brentwood Town Centre SkyTrain Station, Highway 1 and Lougheed Highway transit routes. 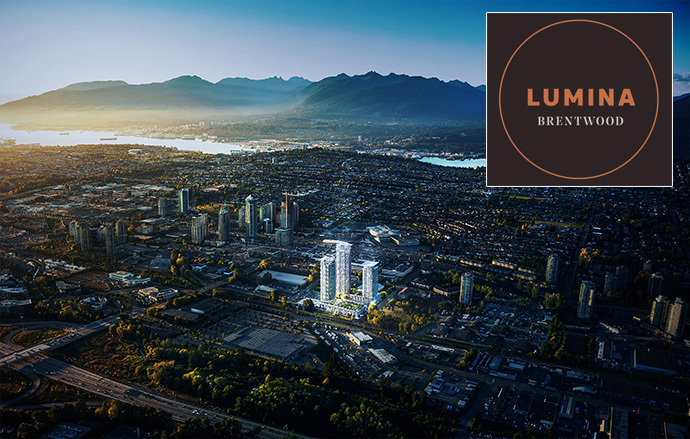 In addition, because of it’s enviable location, many of the Lumina Brentwood condos will feature breathtaking views stretching from the North Shore Mountains to Metrotown and even Downtown Vancouver. Most floorplans also feature over 100 square feet of balcony area. Residents at the new Lumina Brentwood condos can enjoy many outdoor amenity spaces that include: BBQ area and social lounges, dog walk, outdoor theatre, kids play area, garden plots and dining areas. In addition, Lumina condo residents can enjoy a concierge, port-cochere, private driveway, car co-op, car wash stalls, electric vehicle priority parking and charging stations as well as its central location close to shopping, dining, nightlife, entertainment and more. Picture a place where city and nature come together in perfect harmony. A place where bustling shops and peaceful parks are just steps from your front door. A place where you can explore the sights of a vibrant urban city, then escape to the quiet calm of a lush green oasis. Find it all at Lumina Brentwood. The neighbourhood plan includes fabulous future additions including the completely revamped Brentwood Town Centre Mall, Dawson Highstreet and Willingdon Greenway – all just minutes from Lumina. One, two, and three bedroom homes. Register now for early previews.